We are offering a wide range of Rasgulla Sweet Can to our clients. We are offering a wide range of Sweet Confectionery Tins to our patrons. These products are made from high quality components. 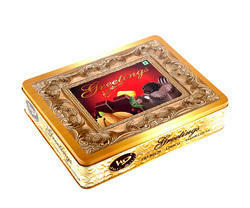 We manufacture tin containers which are used in packing sweets. These types of sweets containers helps in keeping sweets out of moisture and prevent it from getting sticky.